Racing limelight might shine its beacon 59 miles away in the shadow of Cleeve Hill, but Towcester will pay a fitting fanfare to a true legend on Thursday when the action gets underway at 1.20pm. The third race on the card is the Happy Birthday To Hugo Bevan Handicap Hurdle, celebrating an 82nd landmark to one of the most extraordinary officials and characters ever to step foot on a racecourse. 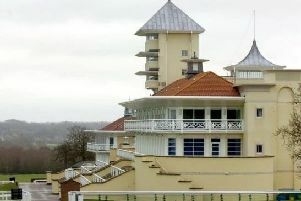 Currently stretching his association at Towcester well beyond 40 years, Bevan was a clerk of the course for 27 of those. He grasped full use of the phrase ‘multi-tasking’ long before it was familiar in modern language, officiating at Huntingdon, Windsor, Warwick and Worcester as well as his much beloved local track. Just for good measure, it wasn’t unheard of for him to lend a hand at Southwell or Aintree where his great friend and mentor John Hughes presided for so long. Since standing down from the clerk role he has appropriately served Towcester time in the sphere of raising a glass with winning owners, adding a life time of humorous stories, experience and chit-chat to what is liberally termed as the ‘complete racecourse package’. round the champagne glasses at the end of the current season in May. Elsewhere on Thursday’s card, trainer Henry Oliver will be keen to extend his best ever season for training winners, with Samarayia and Whispering Harry likely to contest the 1m 7 1/2f handicap hurdle at 1.55pm and the 2m 3f conditional jockeys’ handicap hurdle at 3.55. Whispering Harry runs for county based owner Richard Whitehead who has already tasted life in the Towcester’s winner’s enclosure twice this season with Fairy Pol and Dr Des. Oliver has saddled 22 winners this season and will be keen to add to that tally. Previous course winners abound in the 3.15 race, the starspreads.com Handicap Chase over 3m. Henry Daly’s grey Upbeat Cobbler, always popular with local football supporters, dual 2017/18 Towcester winner How’s My Friend, Black Narcissus and Heurtevent could all be in the mix at the end of a typical slog over the fences and onto the final climb to the line.